Do business owners have a right to run their businesses in accordance with their deeply held religious beliefs? Sweet Cakes by Melissa - Portland, OR. - Under fire for refusing to sell a wedding cake to a Lesbian couple. The Kliens, owners of Sweet Cakes, are now faced with debilitating fines and orders to stop following their conscience. They are suing the State of Oregon under the First Amendment. A gag order was sworn out against them stating that they could not advocate discrimination, in other words they could not explain why the oppose homosexual marriage or why they did what they did. Masterpiece Cakes - Lakewood, CO. - Also refused to bake a wedding cake for a gay couple. Phillips, the owner of Masterpiece, was ordered to attend reeducation classes to keep him from discriminating in the future. Alliance Defending Freedom is working on the case. "American tradition has always held that individuals must have the ability to conduct their lives in accordance with their beliefs as long as it does not violate another individuals inherent rights. Buying a cake from Masterpiece Bakery is not an inherent right, nor is there a right to not be offended. On the other hand running a business in accordance to beliefs is an inherent right. Only until we remember that one of the primary rights of democracy is the right to freedom of conscience and to act accordingly and debate accordingly we will find ourselves facing totalitarianism." - Freedom's Defenders "Masterpiece Cakes may no longer make wedding pieces solely for their Master." The United States Supreme Court ruled in favor of Hobby Lobby in this case. Hobby Lobby's case is more than just about one business. It is about whether America will betray the principles of religious liberty, by forcing a Christian business owner to purchase Abortion inducing drugs. Hobby Lobby has sued U.S. Health and Human Services over the mandate that requires companies to cover abortion-inducing drugs in employee health care policies. Hobby Lobby is run by Christians who believe that abortion is wrong. Hobby Lobby's case was just heard and the Supreme Court ruled on June 31, 2014 that the Health and Human Services Mandate did not follow the law. If the ruling came down against Hobby Lobby, Hobby Lobby could haved faced fines of up to 1.3 million dollars per day for failing to comply with the mandate. 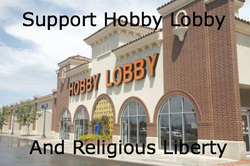 Please join us as we stand with Hobby Lobby and for religious freedom! Our petition can be found here. You can learn more at www.becketfund.org/hobbylobby. To read the Court transcripts click here. For information on the rest of the cases challenging the dangerous HHS mandate go to the Becket Fund's information central. To read about Hobby Lobby's win and what it means click here.